We would first like to remind you of the call for proposals for SDM that we recently sent out. Please see below for more information. This month’s newsletter contains an announcement of an upcoming parallel session to be held at ISAP2016 in Yokohama, Japan, and reports from three recent events: a workshop on mountain landscapes held in Lijiang, China; an IPSI Case Study Workshop held in Tokyo, Japan; and the Eighth Trondheim Conference on Biodiversity held in Trondheim, Norway. We would also like to inform readers of the latest newsletter from the COMDEKS project and two requests for cooperation from our colleagues: a request for reviewers for the IPBES External Review of First Order Draft Assessments; and a questionnaire on social equity and protected areas. We hope many of you will find time to help out with these. We also received word of an upcoming training workshop on forest science and traditional forest knowledge to be held in Beijing, China. We would like to gently remind readers of the call for proposals for the Satoyama Development Mechanism (SDM) 2016. 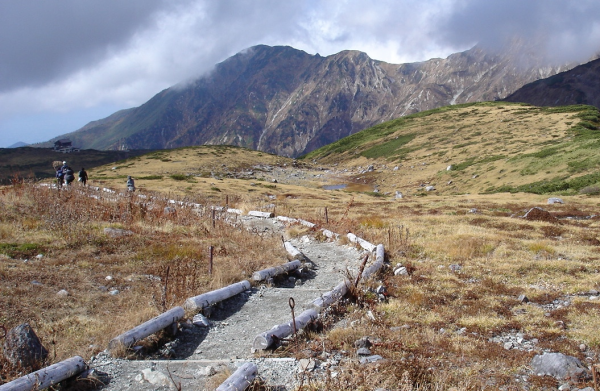 The SDM has been established by the Institute for Global Environmental Strategies (IGES), the United Nations University Institute for the Advanced Study of Sustainability (UNU-IAS), and the Ministry of the Environment of Japan (MOEJ) in order to facilitate further implementation of activities that support the Satoyama Initiative. One or two projects will be selected under each of four project types, and will be provided with a maximum support of approximately 10,000 USD for their implementation. Eligibility for applicants is for IPSI member organizations only, and proposals for implementing IPSI collaborative activities will be highly welcomed. The IPSI Secretariat at the United Nations University Institute for Advanced Studies (UNU-IAS) and the Institute for Global Environmental Strategies (IGES) are pleased to announce the hosting of a parallel session on “Integrated landscape management: Effective approaches for translating knowledge into transformative actions” during the eighth International Forum for Sustainable Asia and the Pacific (ISAP2016), on Wednesday, 13 July 2016 in Yokohama, Japan. Translating conservation and sustainable-development theory into action in the real world often requires linking diverse stakeholders, all of whom may have different interests ranging from local to international levels. Integrated approaches to landscape management have the potential to bridge this diversity, allowing biodiversity and anthropogenic production activities to coexist. This parallel session will focus on sharing knowledge and fostering further action through integrated approaches in order to meet threats facing SEPLS today. For more information on ISAP2016, please see the IGES website here. 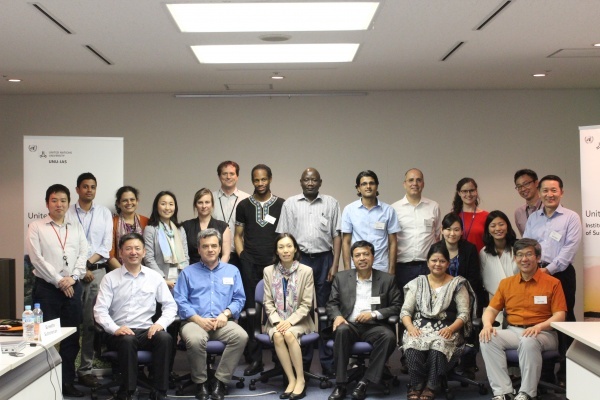 A workshop was held by the IPSI Secretariat along with IPSI partner the Institute for Global Environmental Strategies (IGES) from 25 to 27 May 2016 at the United Nations University Headquarters in Tokyo, Japan as part of the process toward the publication of the second volume of the “Satoyama Initiative Thematic Review” (SITR vol. 2). The theme of this year’s workshop was “Incorporating concepts and approaches of socio-ecological production landscapes and seascapes (SEPLS) into policy and decision-making”, covering various measures taken to incorporate SEPLS concepts and approaches into policies, institutions, economic mechanisms and other frameworks that widely influence the decision-making and behavior of people and organizations. The objective of the workshop was to share case studies among the SITR vol. 2 authors and get feedback on their manuscripts for further improvement. Concrete proposals and examples of SEPLS approaches for policy and other frameworks, as well as the socioeconomic and environmental contexts of the cases, success factors and challenges, and overarching principles for mainstreaming SEPLS were presented and discussed. The SITR vol. 2 is planned for publication in time for CBD COP 13 later this year, and will have the same theme as the workshop, including write-ups of the case studies presented and a synthesis paper aimed at bringing together the various projects and extracting lessons learned. For more information on this event, please see the IPSI website here. 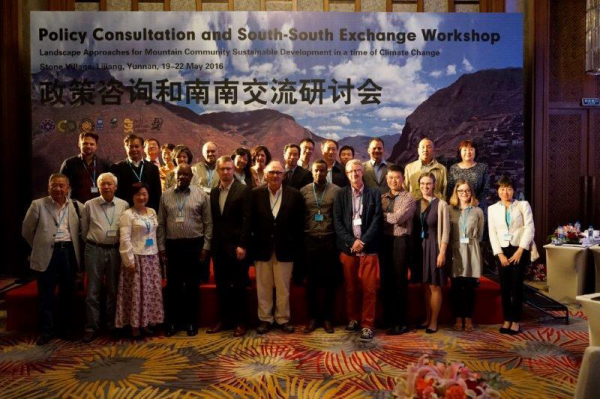 IPSI Secretariat staff recently took part in a workshop titled “Landscape Approaches for Mountain Community Sustainable Development in A Time of Climate Change: Policy Consultation and South-South Exchange Workshop”, held in the Baoshan Stone Village of Lijiang, China from 20 to 23 May 2016. The Workshop was held to explore and promote community-led landscape approaches as critical tools for sustainable development, climate adaptation and poverty alleviation in the context of bio-cultural landscapes. Participants from the International Network of Mountain Indigenous Peoples (INMIP) also engaged in seed exchanges with the community of the Stone Village. Mr. Kazuhiko Seriu of the IPSI Secretariat presented an introduction of the Satoyama Initiative and IPSI, and the “Indicators of Resilience in SEPLS” project, and was invited to be one of the discussants in a roundtable addressing two key questions: 1) importance of designation for indigenous-led landscapes and 2) effectiveness of indicators for indigenous-led landscapes. He and Mr. Yohsuke Amano were happy to see representatives of several other IPSI members present and active in the workshop as well. The Eighth Trondheim Conference on Biodiversity was held from 31 May to 3 June 2016 in Trondheim, Norway, hosted by the Norwegian Government in partnership with the Convention on Biological Diversity (CBD), the Food and Agriculture Organization of the United Nations (FAO), the Global Environment Facility (GEF), the United Nations Development Programme (UNDP), the United Nations Environment Programme (UNEP), the United Nations Educational, Scientific and Cultural Organization (UNESCO) and the World Bank. 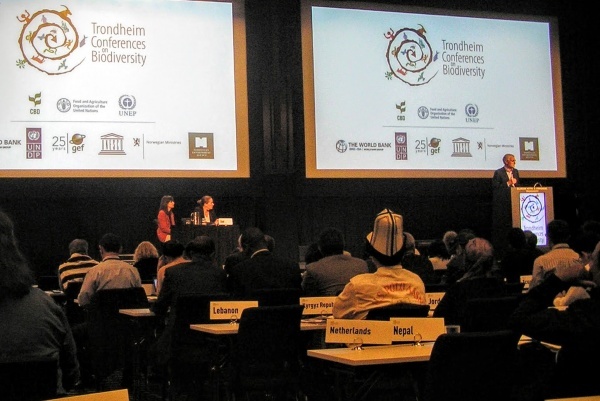 The Trondheim Conference on Biodiversity has been held since 1993, and is one of the major events in biodiversity-related processes including in the lead-up to CBD COP 13 to be held in December 2016 in Cancun, Mexico. The theme of this year’s conference, “Food systems for a sustainable future: Interlinkages between biodiversity and agriculture”, held a great deal of relevance for the Satoyama Initiative and IPSI’s activities. The conference brought together representatives from both the biodiversity conservation and agricultural sectors of many party nations to the CBD, and inspired a lot of discussion on the integration of biodiversity and agriculture in policies and actions looking to the United Nations’ “2030 Agenda for Sustainable Development” including the Sustainable Development Goals (SDGs). Mr. William Dunbar from the IPSI Secretariat attended the conference and was pleased to see many IPSI members, both from national governments and other organizations including international organizations and NGOs, taking an active role in the discussions. Many participants were already familiar with the Satoyama Initiative, while others were new to the idea and expressed interest. For more information on the conference, please see the event website here. The IPSI Secretariat has received an announcement for expert reviewers under the Intergovernmental Science-Policy Platform on Biodiversity and Ecosystem Services (IPBES), and we would like to share this with any readers interested in taking part in the process. As part of the process in the development of IPBES assessment reports, the external First Order Draft review by experts of the IPBES thematic assessment on land degradation and restoration (Deliverable 3bi) and of the four regional assessments (Africa, Asia Pacific, Americas, and Europe and Central Asia) on biodiversity and ecosystem services (Deliverable 2b) will run for six weeks from 30 May 2016 until 11 July 2016. These assessments, each focusing on a theme or region, cover the status and trends of biodiversity and ecosystem services, benefits provided to humans and societies, direct and indirect drivers of change, future scenarios and modeling, governance options, institutional arrangements and decision-making. The IPBES Secretariat invites all expert reviewers with relevant knowledge and/or experience to register to review one or more chapters of one or more assessments. Since many IPSI members are experts in IPBES-related issues and processes in countries all over the world, we highly recommend that members consider getting involved and helping to review the assessments based on their expertise and from the perspective of SEPLS. Please see the full announcement on the IPBES website here. Interested reviewers can register here. The IPSI Secretariat recently received a request from our friends at the Natural History Museum of Denmark to help spread the word about a research questionnaire they are carrying out on social equity concerns in the creation and management of protected sites. This is part of a project about tracking equity issues in Aichi Target 11 with IPSI partner UNEP-WCMC, and the researchers particularly highlighted Satoyama Initiative perspectives as effective conservation measures deserving of attention. We hope many readers will take a few minutes to fill out the questionnaire. The questionnaire is structured into three sections and consists of 12 questions. The expected time to complete the questionnaire is about 15-30 minutes. Please click on one of the links below to participate in this research. The IPSI Secretariat recently received an announcement of an upcoming training workshop from our colleagues at IPSI member Renmin University of China. The workshop is organized by the International Union of Forest Research Organizations and will be titled “Systematic Review in Forest Science – Learning from Traditional Forest Knowledge”. The workshop will be held 21-23 October 2016 at Beijing University in Beijing, China. For more information and the full announcement, please see the IUFRO website here.